Going paperless means saving reams of paper and leaving less of a carbon footprint on the environment. 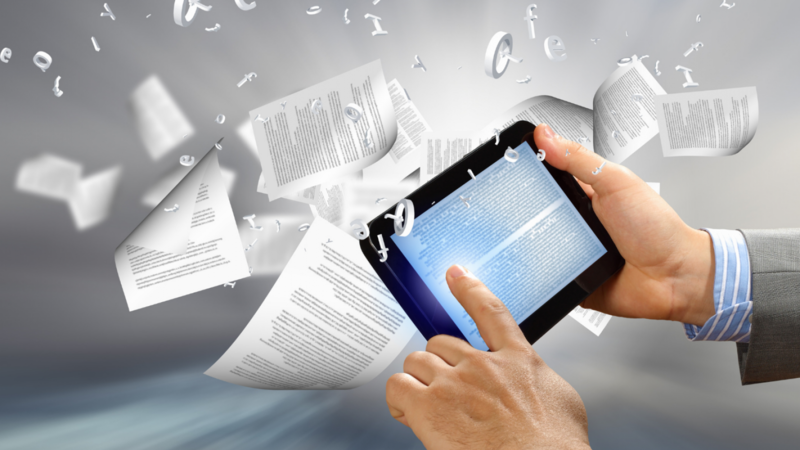 Going totally paperless must be conducted in stages as employees learn new digital interfaces and procedures. If you are thinking about the benefits of the cloud, consider the following four challenges of a paperless office. The potential for human error is possible even with electronic record systems. From transcribing wrong names to incomplete scanned documents, training employees about newer technologies when going digital is paramount. Stored documents are also susceptible to accidental deletion. Accept that errors will occur, but with solid training, the benefits of going paperless outweigh the challenges. 2. Should You Digitize Old Files? It will take time and money to scan all your old files. How many years worth of files are you required to store by state and federal mandates? If zero, consider setting a date to transition to going paperless. Regardless, set a deadline as a smart goal for your staff to meet and overcome reluctance. You also can outsource the digitization of paper files, especially since most companies will pick up the files, to keep your focus on serving your customers. One of the top threats of a paperless office is a hardware failure resulting in lost data. The company must regularly back up its data especially in the case that equipment suffers a breakdown. Cloud-based storage can protect the company form vital data loss, particularly in the instance of flooding or fire. First and foremost, the company must secure protection against hackers and ensure that customer data remains fortified. Always be transparent with customers about how you use their data and what’s happened to it. You’ll need antivirus and firewall security along with encryption technology. If a hacker gains access to your data, the encryption prevents them from using it. Going paperless will save you particular costs and give you bonus points with customers for doing better by the environment. However, you must accept that you will still deal with paper in your daily business conduct since other businesses may not follow similar policies. It takes time to adjust to a new operation. Implement the process in stages. Contact us for more tips on going digital and other considerations of doing business in the technological age.